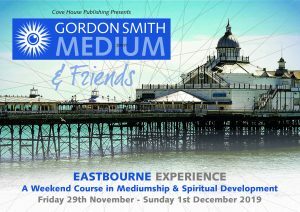 I am delighted to invite you to my Eastbourne Experience from Friday 29th November to Sunday 1st December 2019 this year, at the Hadleigh Hotel. The weekend is designed for you to experience teachings with me, Gordon Smith, on trance and altered-states. Among my friends coming along will be Billy Cook, who will help you understand good platform mediumship, Janet Birdseye who will work with you to improve your private readings, and Steven Levett who will cover all aspects of healing, including trance healing. Throughout this special weekend, you will get to work with every tutor, as well as enjoy public demonstrations of mediumship with the team. The cost of the Eastbourne Experience is £285 per person, and this price includes all teachings and accommodation (half-board plus Sunday lunch). The only way to register for this event is by emailing us at enquiries@covehousepublishing.com. You will then be contacted by a member of the Cove House Publishing team who will take a deposit and confirm your registration and room requirements. The Eastbourne Experience is all about building your spiritual gifts and having a fun weekend with like-minded people; all you have to do is come along, open your heart and your mind.